Green Devil Genetics have used the most advanced technologies and the latest techniques to create their seeds. A large part of their genetically unique cannabis plants are not only known worldwide but are multi-priced varieties on various cannabis cups. 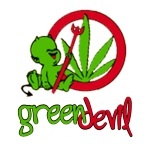 Green Devil Genetics cannabis seeds are derived from strains of medicinal cannabis with a high concentration of CBD and THC. Mainly the breeder wants to produce his products for the medical consumer.